Millefiore Calendar Wall Hanging Kit. 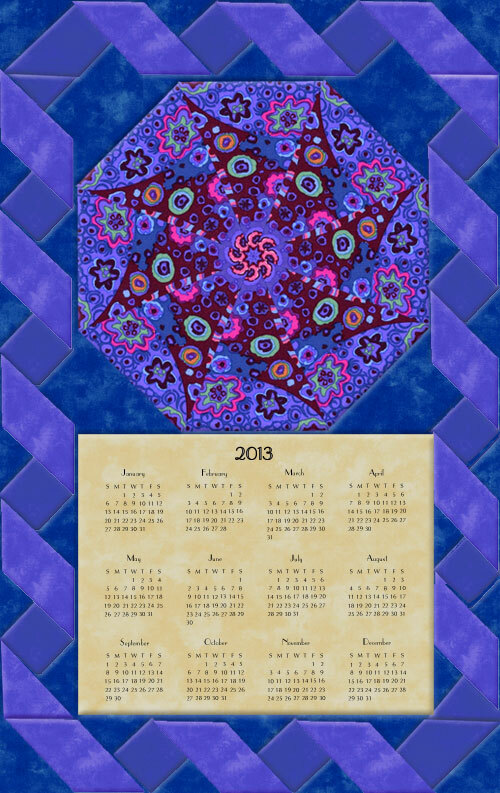 Kaleidoscope cut from Millefiore by Kaffe Fassett. Millefiori is a glasswork technique which produces distinctive decorative patterns on glassware. The term millefiori is a combination of the Italian words "mille" (thousand) and "fiori" flowers. From Westminster Fabrics. American artist Kaffe Fassett has translated this artform into a bold print. The colors are periwinkle, mint , purple and coral on a dark periwinkle ground. This includes the illustrated instructions to make this Wall Hanging as well as a preprinted 8 1/2 by 6 3/4 inch muslin insert with the calendar printed on it. The finished size of the Wall Hanging is approximately 11 by 17 1/2 inches. Block and 3 fat quarters included.